Most new investors know that a Roth IRA can be one of the greatest tools in your investing arsenal. By contributing after-tax dollars to it, you are allowed to grow the money tax-free. There are no taxes owed on any investment gains. There are no taxes owed on the withdrawals once you reach retirement age. It's a fantastic deal. If you want to help your child supercharge their own wealth building, one way you can do it is by opening a Roth IRA for kids. If your child earns any money at all, whether it's from mowing the lawn, working at McDonald's, or appearing in commercials, they are eligible for a kids Roth IRA. Why would anyone bother opening a Roth IRA for kids? Time. Specifically, the power of compounding. In essence, the longer you allow investments to grow, the larger they will become. Imagine starting to fund a kids Roth IRA when they get their first job at age 16. If they continue to contribute until they retire at age 65, that's a whopping 49 years of growth. Imagine you are a prosperous dentist. You decide to open a Roth IRA for your son or daughter and contribute $458 per month into it. You use this money to invest in a low-cost index fund that mirrors the Dow Jones Industrial Average or S&P 500. When your child turns eighteen, you have them take over the funding responsibilities. Further, imagine that the account grows at about the same rate those indices have for the past century or more. You never increase your contributions to keep pace with inflation. By the time your kid reached retirement age, or 65 years old, that Roth IRA would have more than $3 million in it if you assume an annual return of 8%. If you re-invest the dividends, you'd have exponentially more. The biggest reason people fail to take advantage of the staggering power of compound interest, which Albert Einstein called the greatest force in the universe, is a lack of knowledge. The average guy simply has no clue that saving $5,500 per year can lead to a mind-boggling fortune. They don't understand how you can earn interest on your interest or dividends on your dividends. It isn't taught in schools. It seems boring, until you realize that it is the golden ticket that can unlock every door and pry open opportunities that would otherwise be beyond your family's reach. 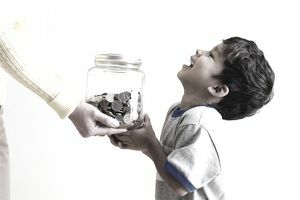 The biggest challenge you will face when you open a Roth IRA for kids is that your child needs to have earned income. That is, if they save $5,500 per year, that money can't be a gift. They need to have generated it as income, filed a tax return, and paid income taxes on it. That might seem like a problem for a 9-month-old baby, but it isn't as insurmountable as you think. If you or a family member owns a business, hire the child to act in commercials, to appear in print ads, or on billboards. What is a tax-deductible expense to you becomes income to them, taxed at a much lower rate, and is capital they can put aside into their Roth IRA. Once they get a little older, hire them to do chores or mow the lawn. When they are teenager, let them get their first job. They could then put their entire paycheck into the Roth IRA and then you could give them a spending money allowance equal to whatever their paycheck was.